Solid-Edge or Grooved Decking: What Should You Buy? So, you’re going to build a deck, and you’re looking at decking, and you notice that some deck boards have grooved (aka slotted or pre-grooved) edges, and some deck boards have solid (aka square) edges. How do you decide which type to get? Appearance – how important is a fastener-free appearance? Will it bother you if screws show? Will board edges be visible? Installation – how difficult is the fastening method? Do you need to buy special tools? Are the tools easy to use? Budget – figure the total cost of decking plus fasteners and any tools you might need to buy or rent. Appearance: The primary reason people choose grooved decking is because they don’t want to see deck screws messing up their deck’s surface. Grooved decking has slots cut into both sides so it can be installed with hidden fasteners. This results in a clean-looking deck surface without visible screws. Budget alert: Grooved-edge decking usually costs more than solid-edge boards, and hidden fastener kits are more expensive than deck screws. 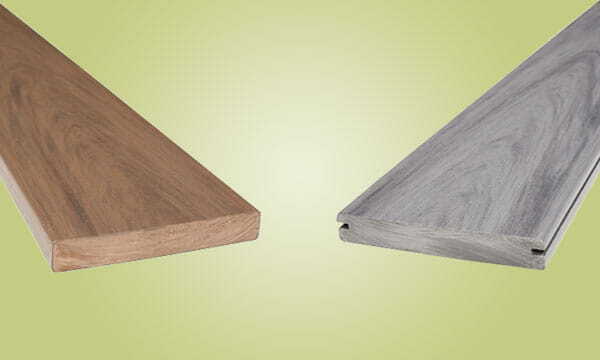 Compatibility alert: Because the width of the groove can vary between manufacturers, make sure that you buy hidden fasteners that are compatible with your decking choice. Some brands also sell fasteners designed for their decking (like these). Check the gap. Hidden fastener clips dictate the spacing between installed deck boards—the gap width can be different across brands. If you’re particular about your deck board spacing, make sure to check this spec. Check ease of repairs. With some hidden fastening systems, replacing a damaged deck board can be complicated. If you’ll be making any future repairs yourself, find out how hard that will be with each type of hidden fastening system you consider. Side note: You’ll probably still need some solid-edge boards. When board edges will be exposed (on stair treads or around the deck’s perimeter, for example) grooved decking is not the best choice—because, visible grooves. You’ll get better-looking results when you use solid-edge decking. Budget and appearance: These deck boards usually cost less than grooved. The most common installation method is to drive deck screws directly through the face of the board to the joist (face mounting). This is fast and economical, but you’ll see the screws. Installation alert: If the screws aren’t perfectly flat against the decking, furniture legs and flip-flops might catch on them. And, over time, as wood decking shrinks, the screws might stick up, so you’ll need to fasten them back down. Plug the screw holes. Face mount the boards, but countersink screws. Then fill the hole with a plug that matches the decking material. Done well, this results in a surface that appears fastener-free because you’ll hardly notice the plugs. Some people make their own plugs. Luckily, kits with premade plugs are available for both composite and wood decking. Make your own grooves. If you have the time and the tools, you can rout slots into solid edges and use hidden clips designed for grooved boards. That seems like too much work, but your budget might not think so (as long as you don’t have to buy a router). Get a hidden fastener system or installation tool designed for solid-edge decking. Note: some of these clips need to be installed from underneath the deck. If that doesn’t appeal to you, check the installation instructions before purchasing. So, grooved or solid edges? All things being equal, you’ll get good results with either choice if you follow installation instructions. Pick your look and do the math. Your budget might even tell you it’s OK to hire a pro deck builder, and that’s cool, too.